Create a Personalized Letter from Santa Claus in Minutes! It's never too late to send a Santa letter to your child! Help St. Nick create a customized letter that you can print at home in just minutes. So even if it's Christmas Day, Santa won't forget your child! Simply choose from one of our Santa letter templates and personalize it with details such as your child's name, age, hometown, gender, and accomplishments this year. Then select one of our six colorful background designs. It's easy and fun! 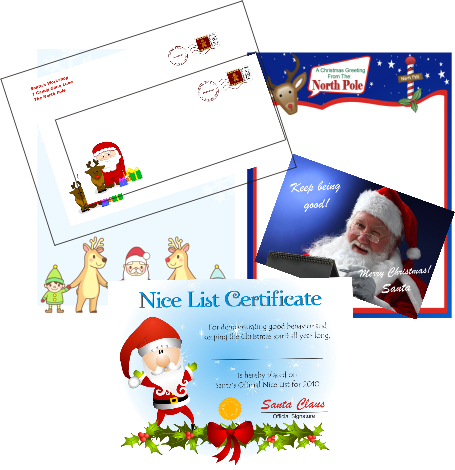 We offer a variety of letters and backgrounds so you can create just the right message from Santa Claus. Then preview your printable Santa letter. Once you're happy with the results, select from one of three great packages that offer fun add-ons such as a letter from Rudolph, an autographed photo of Santa Claus or a personalized Nice List Certificate - all for less than you'd pay some companies for a single letter! Or, if you prefer, select a simple package with just your Santa letter and envelope. Then make your purchase with a credit card or PayPal account through our secure PayPal connection and you'll be able to download and print your customized letter immediately from your own download link. We make it easy for parents, grandparents, aunts, uncles, teachers, friends or anyone to create personalized letters from Santa Claus for all the children in your life.